The casa from Denny and Rafaela is a very private casa particular located on the second floor with your own entrance and a rooftop terrace. Just a few minutes from the center of Baracoa. We stayed in this splendid casa for 4 nights. 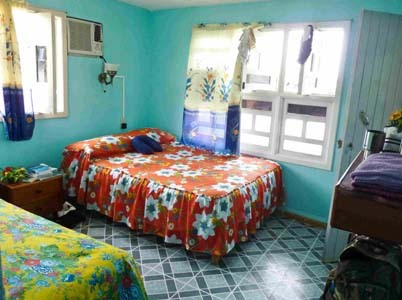 It was one of our best Casas we stayed in on our voyage through Cuba and the best terrace you can dream of. A perfect choice! One of the best experiences we had in Cuba! Denny and Rafaela are fantastic hosts and we will definitely be coming back in the future to Baracoa just to visit them! The house, located 7 minutes from the city centre, is very clean, comfortable and safe! The rooftop terrace offers some shade accompanied by a sea breeze and is extremely pleasant at all times of the day. Denny will gladly give you any required information about the area. How was your room? : the casa offers 2 clean rooms located on the second floor of a beautiful colonial house with a dining/living room and a rooftop terrace. How was the food the offer? : The meals are very delicious and prepared by Rafaela with lots of love and attention. In March visited Baracoa, in Guantánamo province (eastern Cuba), where we stopped for some days. We had a very good time staying at Dennis Rodríguez's and have decided to share the experience with you. Dennis and his wife Rafaela own a very nice, clean and comfortable house in the centre of this genuine cuban town where they rent rooms to the tourists. Perhaps the main difference with respect to common "casas particulares" in Cuba is the privacy and independence that the guest can get. The rooms are located on the second floor, with direct access from the street, and they provide you with the keys so that you can get in and out at your will. The Rodríguez couple are very friendly, generous in hospitality, and always have time to enrol in an interesting conversation about Cuba, its history, or the beauty of Baracoa's surroundings, while enjoying a fresh beer or a cup of coffee together. We strongly recommend this outstanding place if you go to Baracoa. If you do, please tell Dennis you knew about them in this page, so that they can assess how effective this publicity is.